On May 16, Lane ESD and the Curriculum Leaders Forum hosted special guest, White House Champion of Change and Oregon Fab Lab Expert John Niebergall. John shared with us about his adventures aboard the Oregon Fab Lab bringing High Tech Skills to students all across Oregon. 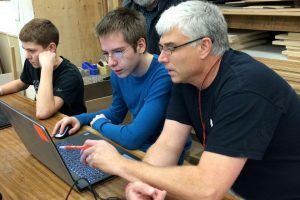 Also, local CTE teachers extraordinaire Polly Kohl (Thurston HS) and Chris McGowan (Willamette HS) with several of their students demonstrated the skills developed in their Career and Tech Education Courses. Discussion Topics Included: Advanced Manufacturing Technology, High Tech Software and Hardware in the Classroom, Computer Assisted Design (CAD), 3D Printing, Robotics, Digital Vinyl Cutting, Lean Manufacturing, MakerSpace How-To, And Much More!